<h2>Turning food waste into animal feed could take a chunk out of livestock emissions</h2><br /><p>Every year around a third of all food produced for human consumption is wasted, according to the <a href="http://www.fao.org/save-food/resources/keyfindings/en/" target="_blank" rel="noopener noreferrer">United Nations</a>. That equates to 1.3 billion tonnes of food down the drain and huge amounts of avoidable greenhouse gas emissions.</p> <p>'Food loss and waste also amount to a major squandering of resources including water, land, energy, labour and capital,' said Professor Montse Jorba Rafart, an expert in agrifood technologies from Leitat, a Spanish technological centre.</p> <p>Instead, this waste could become a sustainable solution for another resource-heavy agricultural sector – animal feed.</p> <p>Prof. Jorba coordinated the NOSHAN project where researchers from seven European countries investigated turning fruit, vegetable, cereal and dairy waste into pork and poultry feed. They found the most nutrient-rich sources of waste came from pumpkins, rapeseed, cheese and yoghurt production, barley, mushrooms and olives.</p> <p>This could take a climate-friendly chunk out of livestock's environmental impact. Currently, <a href="http://www.fao.org/3/a-i8276e.pdf" target="_blank" rel="noopener noreferrer">a third of total farmland</a> is used to grow animal food, while producing, processing and transporting this feed contributes to about 45% of the sector's emissions.</p> <p>Prof. 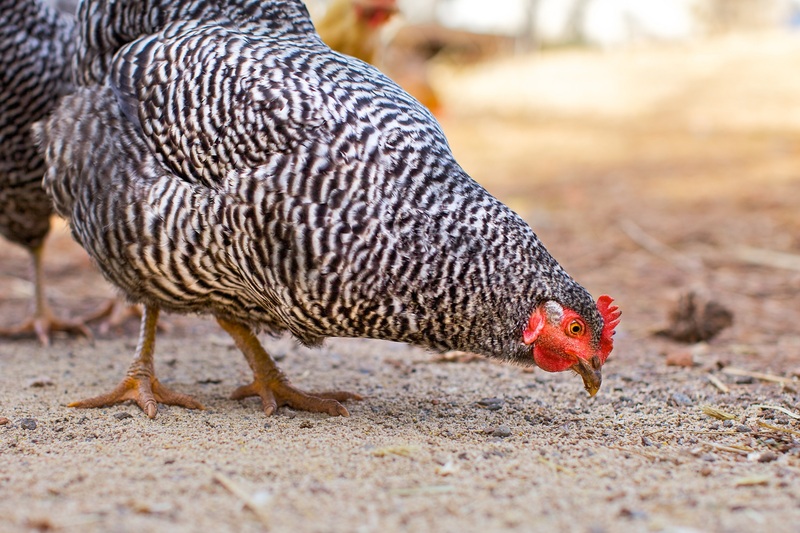 Jorba says that substituting a portion of existing chicken feed for their food-waste-based product could help cut the carbon footprint of the meat.</p> <p>'For every kilogram of (chicken) broiler feed, carbon dioxide emissions are reduced by 300 grams with a 10% NOSHAN mix diet,' said Prof. Jorba. 'Assuming 10% of total broiler feed can be switched to 10% NOSHAN mix, this means a total avoidance of 6.2 million tons of CO2 emissions to the atmosphere each year. '</p> <p>NOSHAN's business partners are currently looking to turn their research into a product and hope to commercialise it in&nbsp;two to three years.</p> <p>Big CO2 savings could also be expected with their feed for pigs, while cattle, sheep and goat feed is an avenue that researchers could explore in the future.</p> <p>If a similar approach expanded to the global livestock sector, Prof. Jorba estimates a reduction of natural land transformation by 30% and agricultural land occupation by 12%, which would protect carbon sinks and prevent greenhouse gas emissions from the additional intensive agriculture.</p> <p><strong>Deforestation</strong></p> <p>Many European farmers rely on importing soy-based animal feed, but these products often contribute to deforestation in places like the <a href="http://wwf.panda.org/what_we_do/footprint/agriculture/soy/consumers/" target="_blank" rel="noopener noreferrer">Amazon in Brazil&nbsp;and Chaco in Argentina</a>.</p> <p>Although NOSHAN's products cannot completely replace this animal feed they can still relieve pressure from soy-based feed and diminish the sector’s environmental impacts. The operation is also more energy-efficient than conventional feed production, which means another cut in livestock's carbon footprint. &nbsp;</p> <p>'By reducing the amount of raw materials, such as soybean, used for the piglet and broiler diets, NOSHAN decreases the soy dependency of European feed industry,' said Prof. Jorba. 'Obtaining feed ingredients from natural (waste) sources could also reduce the cost of feed (for farmers). '</p> <p><img class="@alignleft@" title="By partially replacing feed from fresh sources like soy with NOSHAN's products the environmental impact of animal feed can be reduced. Image credit - NOSHAN" src="https://horizon-magazine.eu/sites/default/files/NOSHAN%20feeds.jpg" alt="By partially replacing feed from fresh sources like soy with NOSHAN's products the environmental impact of animal feed can be reduced. Image credit - NOSHAN" width="1600" height="1200" /></p> <p>Along with animal feed, many European farmers are dependent on imported fertilisers to ensure their land has the right soil conditions to grow crops productively. However, these products come from unsustainable sources with their own set of environmental impacts.</p> <p>To produce synthetic, or factory-made, fertilisers, a huge amount of fossil fuel is required. Mineral fertilisers, like phosphate, are brought in from huge mining operations in Morocco and China where, according to Professor Siegfried Vlaeminck, an environmental engineer from University of Antwerp in Belgium, supplies are running low.</p> <p>'In 50 to 100 years we may run out of the readily accessible phosphate,' he said. 'Nonetheless, phosphorus is irreplaceable as a fertilising element to sustain crop growth yields. '</p> <p><strong>Untapped</strong></p> <p>If no alternative is found, then these energy-intensive industries could look to start new mines elsewhere and spread their environmental impact to other regions. It also means EU's animal farming remains dependent on finite resources, but there is a largely untapped solution much closer to home – and in plentiful supply.</p> <p>'We have massive amounts of animal waste in Europe, due to the fact that we have a lot of intensive livestock farming,' said Prof. Vlaeminck, who was also the coordinator of ManureEcoMine, a project that aimed to refine nutrient-rich animal manure into green fertilisers.</p> <p>The project estimated that European pigs and cows jointly produce 1.27 billion tonnes of manure per year, enough to fill more than 500 000 Olympic-sized swimming pools. Currently, this manure is either sprayed inefficiently on farmland or undergoes low-grade processing, both of which have negative environmental impacts.</p> <p>Instead, ManureEcoMine came up with a biorefinery that processes manure from different animals, extracts key nutrients, and upgrades them into green fertilisers. These can be custom-made for different farms depending on the needs of a crop or the soil.</p> <p> <div class="quote-view quotesBlock quote_horizontal"> <div class="quotesTop"><img src="https://horizon-magazine.eu/sites/all/themes/horizon/images/quotes_top.png" alt="" title="" /></div> <p>'We have massive amounts of animal waste in Europe, due to the fact that we have a lot of intensive livestock farming. '</p> <blockquote><p>Prof. Siegfried Vlaeminck, University of Antwerp, Belgium</p></blockquote> <div class="quotesBottom"><img src="https://horizon-magazine.eu/sites/all/themes/horizon/images/quotes_bottom.png" alt="" title="" /></div> </div> </p> <p>The researchers are now looking for funding to scale up the approach, but Prof. Vlaeminck says farmers are too reliant on synthetic fertilisers and 'need to be convinced to switch' to more sustainable alternatives.</p> <p>To help sway them, the project estimated that by switching to green fertiliser, European farmers could cut €4.5 billion from the current annual €15.5 billion bill for synthetic fertilisers. ManureEcoMine's approach would also redirect this cash back into local economies.</p> <p>Still, this business model is based on an intensive livestock system, which itself has significant environmental impacts, but unless or until everyone stops eating meat, the sector needs sustainable innovation.</p> <p>'We need to find a solution for the massive amount of manure today. If we are serious about leveraging sustainability on a large scale, manure is definitely one of the hotspots to work with,' said Prof. Vlaeminck.</p> <p><em>All research in this article is funded by the EU. If you liked this article, please consider sharing it on social media.</em></p> <p><a href="http://bit.ly/newsalertsignup" target="_blank" rel="noopener noreferrer"><em><img src="https://horizon-magazine.eu/sites/default/files/news-alert-final.jpg" alt="" width="983" height="222" /></em></a></p> <br /> <img src=”http://www.google-analytics.com/collect?v=1&tid=UA-40077089-1&cid=turning-food-waste-into-animal-feed-could-take-a-chunk-out-of-livestock-emissions&t=event&ec=republish&ea=read&el=turning-food-waste-into-animal-feed-could-take-a-chunk-out-of-livestock-emissions&cs=republish&cm=republish&cn=republish&cm1=1" /> This post <a href="https://horizon-magazine.eu/article/turning-food-waste-animal-feed-could-take-chunk-out-livestock-emissions.html">Turning food waste into animal feed could take a chunk out of livestock emissions</a> was originally published on <a href="https://horizon-magazine.eu/">Horizon: the EU Research &amp; Innovation magazine | European Commission</a>. 'Food loss and waste also amount to a major squandering of resources including water, land, energy, labour and capital,' said Professor Montse Jorba Rafart, an expert in agrifood technologies from Leitat, a Spanish technological centre. Although NOSHAN's products cannot completely replace this animal feed they can still relieve pressure from soy-based feed and diminish the sector’s environmental impacts. The operation is also more energy-efficient than conventional feed production, which means another cut in livestock's carbon footprint. 'We have massive amounts of animal waste in Europe, due to the fact that we have a lot of intensive livestock farming,' said Prof. Vlaeminck, who was also the coordinator of ManureEcoMine, a project that aimed to refine nutrient-rich animal manure into green fertilisers. To help sway them, the project estimated that by switching to green fertiliser, European farmers could cut €4.5 billion from the current annual €15.5 billion bill for synthetic fertilisers. ManureEcoMine's approach would also redirect this cash back into local economies. 'We need to find a solution for the massive amount of manure today. If we are serious about leveraging sustainability on a large scale, manure is definitely one of the hotspots to work with,' said Prof. Vlaeminck.